Now available in sizes 2" to 12", the Octave Ultrasonic Meter offers highly advanced, all-digital technology and achieves precise measurement without any moving parts to ensure optimum revenue. With a dynamic flow range starting as low as 1/16 GPM, this unique meter solution is a perfect replacement for any mechanical compound, fire service, or turbine meter. Commonly 20% of the utility installed meter base generates 80% of the utility’s revenue. The Octave focuses advanced metering science where the real revenue exists — within the C&I meter assets. 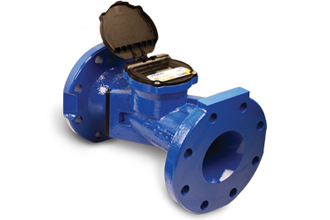 Powerful intel such as Flow Direction, Empty Pipe Alerts, Leak Alarms, Battery Level, and a Rate of Flow are standard. Ultra Precise Leak Registration — As low as 1/16 GPM low flow sensitivity on meter sizes up to 4". Construction Material Options - 316 Stainless Steel Body Construction OR Epoxy-Coated Ductile Iron. Universal Communication Protocol (Encoder, Pulse or 4-20 mA) — Connects to any AMR/AMI system. FM Approved — The perfect Fire Service meter - open design ensures maximum water delivery. NSF Approved — Complies with all safe drinking water requirements. Lifetime Accuracy / Lifetime Revenue — No moving parts means more revenue. longer. Minimal Installation Requirements — No required strainer. Minimal piping considerations. Minimal Head Loss - Decrease poor pressure complaints from customers and reduces pumping costs for the utility.